Click on picture to see video of drone protest. “Well, I’d rather have Obama win than Romney,” said Roger Cuthbertson. “I believe the drones are totally illegal and they’re irresponsible and its going to come back to bite us because we wouldn’t want drones over our skies killing indiscriminately. “There’s been more drones, way more drones under Obama than under Bush. Former FBI agent Coleen Rowley helped organize the Minneapolis protest, one of about twenty held across the country this week to protest the drone strikes and to push back on the growing pressure to wage war on Iran and Syria. “Because people waste their time and energy believing in a candidate and then they don’t come out and work as hard as they can on the issues,” said Rowley. “And in the case of Obama having won it was a cruel disappointment. Actually Obama in many ways is Bush on steroids. 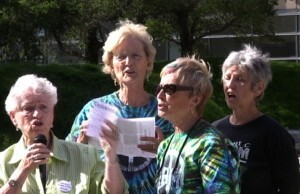 Peace activist protests have gone on for many years. This is one of the few times in history where the tide of this movement has turned so strongly against their one-time champion. The corporate takeover of the Congress has added fuel to the war flames to favor the Pentagon and military contractors. The tempo of local peace protests decreased in the early days of the Obama administration, but is has picked up in recent months to be close to 2008 levels.